There are actually a series of things that led to the end of this particular evening. It actually started last week. The kitchen chairs we’d owned since a 5-year stint in Texas were dying. The wicker on the seat of the chairs was unraveling, the pieces of straw littering the floor of our kitchen every single day like the floor of a barn. I’d blame my kids for breaking them but the reality is that they just didn’t seem to be built as well as they could have and they’d already lasted close to 14 years. That said, I had to buy four new chairs with the anticipation of getting a couple more when I can. When we moved to the rental home we have now I realized that I couldn’t really see brewing an entire pot of coffee for just myself. When there were two of us it made perfect sense. When there was one it seemed a gigantic waste. I broke down and bought one of those Kuerig brewing systems. It worked really well…until tonight. When I went to use it today the system just died. That simply. It took two restarts, turning it off and on again, several times to get the thing to brew one cup of coffee. One time it would be perfect. The next it would be half a cup, muddy water. I look at it and realize that I hadn’t wanted it to die. Just next to it is an expensive, awful, worthless toaster I refuse to replace because it cost so much. My wife bought it because it looked and seemed amazing. It ended up being awful. It’s been a major thing for me – I refuse to replace it until it finally dies. It keeps looking like it might . . . then keeps going. Meanwhile I’ve replaced chairs and now a coffee maker was dead. So in the period where I should have been making lunches or cooking treats for them I ended up at Target looking for another coffee pot. They now have Kuerig 2.0, which brews a full pot of coffee. I won’t go into how long I had to argue to get the gift card the aisle sign said came with it. I got home, ran up the stairs to tuck in the boys, just ten minutes past bedtime, and found my son, Sam, on his knees by the bed. It wasn’t because he was already saying his prayers. I should have noticed at the moment that he wasn’t being sheepish, but I took it that way. I regret that. 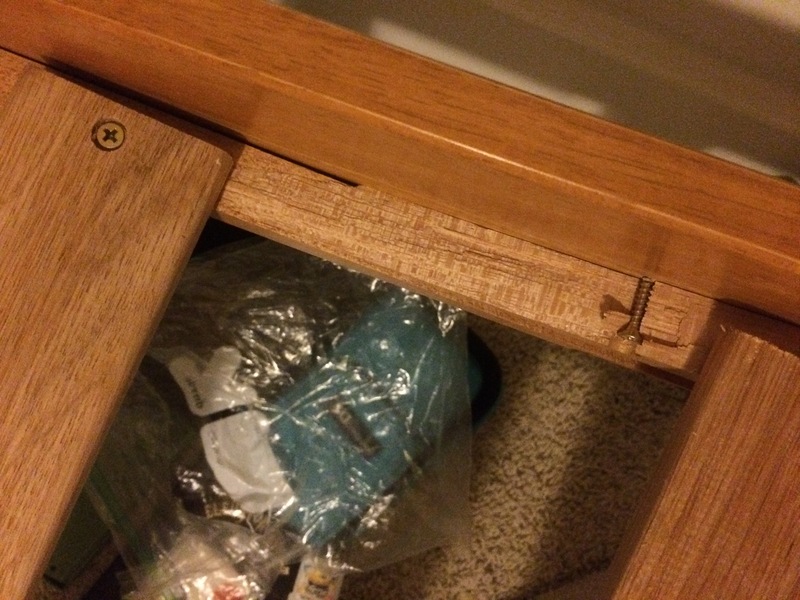 What you see there is the bracing of the bed having broken through the half-inch support on the bottom of his bed. Remember, having just bought both new kitchen chairs and then a new coffee pot, it seemed that this week was destined to make my life miserable. In the end I moved the bed, as it’s not even a simple fix, and put his mattress on the floor. I went down and made lunches. It wasn’t long before I was joined by my sons. I noticed here he was curling his t-shirt in knots and looking at the floor. 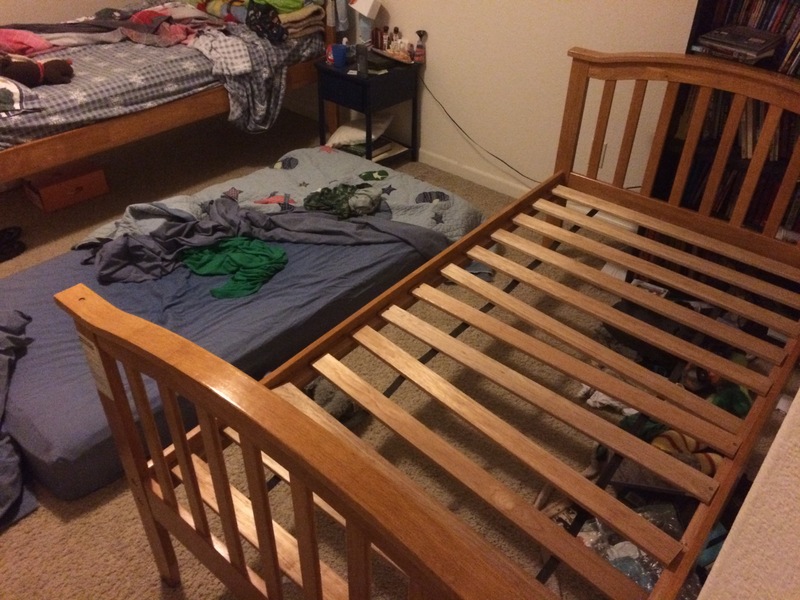 Now…it’s a lot to put into a bed, but bear in mind he’s 11. I realized at that moment, after yelling at him, that he’d already realized he’d broken the bed. He sees that bed as his own transport – like the movie Bedknobs and Broomsticks – to the past. He could lie his head by the headboard and his Mom is there, tucking him in . . . even though it’s me doing it every night. It’s not a bed . . . it’s a time machine, a link to the past. I rubbed his head and told him I’d do my best…it might just have to wait until the weekend. I sigh, brew a cup of coffee because I need to stay up awhile, and look at the new Kuerig when I hear the footsteps behind me.